EHRENBERG – In the back of Harry Vaa’s blue pickup truck is a refrigerator that he’d like to get rid of. And by taking advantage of an annual countywide cleanup event he can do so without having to drive to a landfill and pay to dump it. The eight dumpsters outside a fire station here, along with others stationed around remote La Paz County, do more than allow Vaa and others to drop off sofas, dressers, mirrors, carpet pad and other large items. They helped address the scourge of dumping in the desert. “I was down here back in the ’70s, and in my opinion it’s way cleaner than it’s ever been,” Vaa said. Arizona’s open desert is a magnet for those looking to dump large items and other junk they don’t want to transport to landfills – and perhaps more importantly, pay to dispose of at landfills. And La Paz County has plenty of open desert, in addition to being a magnet for the winter RV set and those who ride off-highway vehicles. The countywide cleanup event, which began in late February and lasts until mid-April at several sites, accepts most trash except for tires, liquid waste and hazardous waste. Ken Olkowski, a county building official and volunteer at the Ehrenberg cleanup site on a recent weekday, said he doesn’t have a clue why people will dump pretty much anything in the desert, from Christmas trees to refrigerators. “Not to pay that $10 or $20 bucks so they don’t have to go to a transfer site … people are just cheap that way, I guess,” he said. Holly Irwin, a member of the La Paz County Board of Supervisors, said the cleanup days used to cost taxpayers more than $40,000 per year. But this year, Republic Services, the landfill operator, picked up most of that cost under a new contract with the county. “We really want to try to keep our deserts environmentally friendly and not to have people think they have to do that (desert dumping) because they cannot either afford to go to transfer stations or … if they can’t go elsewhere to dump some of the larger items,” she said. That’s important, Irwin said, because the county’s main draw is winter recreation. 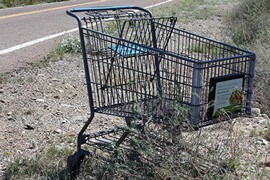 Trashed landscapes can be glaring to those riding quads or hiking trails. Mark Shaffer, a spokesman for the Arizona Department of Environmental Quality, said that in addition to being an eyesore desert dumping fouls water and promotes disease by attracting rodents. 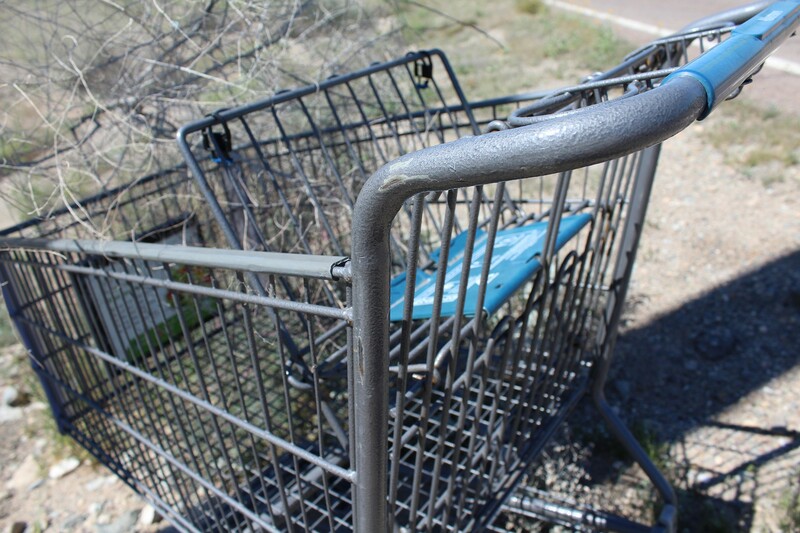 Arizona's open desert is a magnet for those looking to dump items such as refrigerators, sofas and other large items that people don't want to transport to landfills – and perhaps more importantly, pay to dispose of at landfills. And remote La Paz County has plenty of open desert, in addition to being a magnet for those wishing to camp and ride off-highway vehicles. 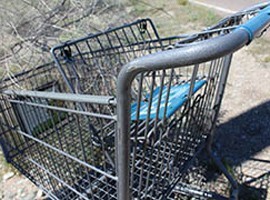 A discarded shopping cart near Ehrenberg illustrates the problem of desert dumping in La Paz County.